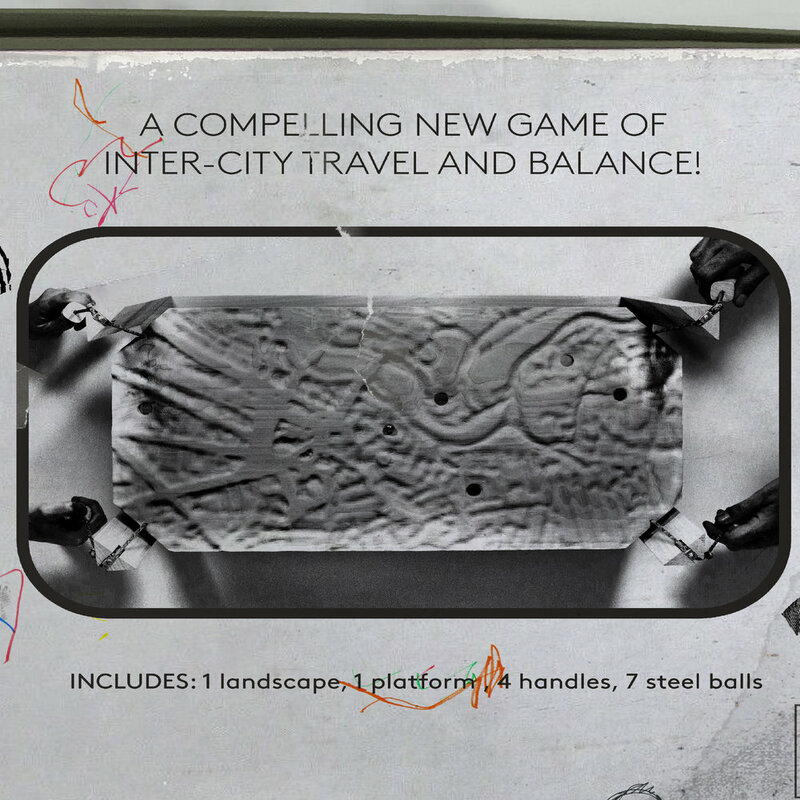 Tilted City Explorer investigates the relationships between routes of over-utilization and under-utilization in the Cambridge/Allston, Massachussets Area in the form of a 2 to 4 player marble game. 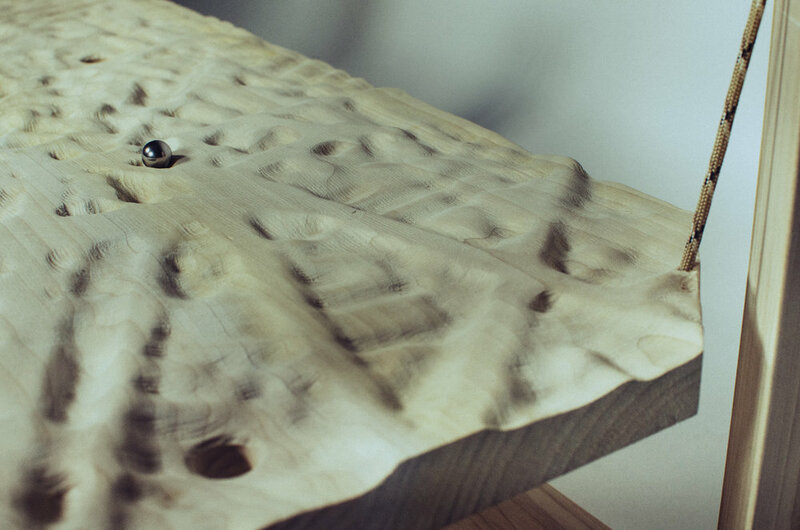 By pulling the handles located at each corner, players are able to tilt the “landscape of usage bias” to influence the marble in their desired directions. By cooperating to resolve the marble’s path over, around, and out of obstacles along their routes, players acquire an understanding of path-use-behavior in a challenging, but exciting way. Because the generation of the “usage bias landscape” elevates areas of over-utilization and submerges areas of under-utilization, players will find it easiest to maneuver throughout the city (in-game) along the routes they least frequently use (in day-to-day life). This is the first challenge Tilted City Explorer presents to its players. Finally, smaller marbles move more nimbly across the landscape but are more prone to falling into the traps mentioned above. Larger marbles ease right over smaller features but become victims of their own momentum as they overshoot their targets. How might these be analogized to the experiences of moving via car, train, or foot? 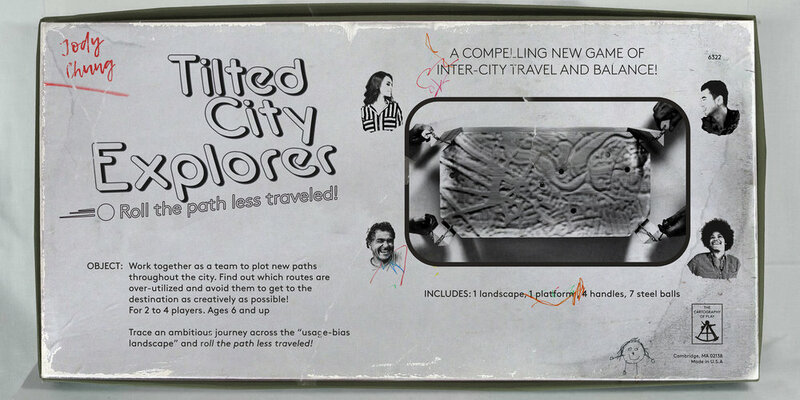 Tilted City Explorer is a way for people to intuit these kinds of relationships for themselves as they participate in a social and cooperative cartographic game. By presenting players with an open-ended platform of play, informed by the data of the city, we can craft engaging experiences for people which are both entertaining and richly informative.